The new Terracide tape! Following the story lines and characters of the Dead with some of the smartest lyrics I've ever heard. Totally crazy, epic instrumentation to match. Holy crap. 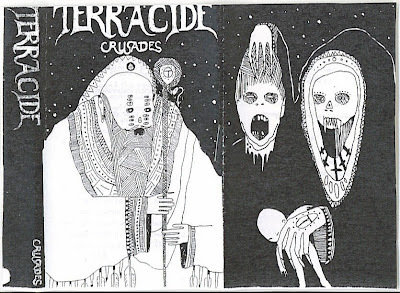 This was released as a limited self released tape by Terracide in 2009. All music and lyrics by Terracide, art by Andy. Recorded by Trent in Trent's Basement. This is awesome! What a great idea, keep up the good work guys. if you ever need blog love let me know. wow, you can still buy tapes huh? amazing.